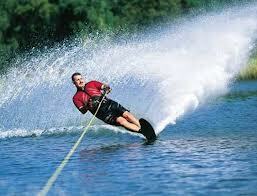 Discover Arizona Water Skiing! If you have already gotten your feet wet with this sport, you already know this is one sport that not only provides the excitement of water sports. This is one sport that keeps you COOL in the hot Arizona summer sun! What Makes Arizona Water Skiing So Popular? With temperatures exceeding the century mark, AZ water skiing just might be the perfect sport! It's both exhilarating and refreshing all at the same time. Some of your water skiing in Arizona options include Lake Havasu, Lake Powell, Canyon Lake Pleasant, Saguaro Lake and Apache Lake. There's something about the water when it gets to be hot here in the summer months... if you have ever taken a dip in the water when the heat is beating down on your skin, you know what I mean. It instantly feels just perfect! There are also many lake properties around populated home communities her in AZ, making things even more easily accessible for those who just cannot seem to get enough of the sport. The trick, by the way, is to lean back a little when the boat takes off. If you lean too far forward, you will likely fall face forward into the water...no worries, though. If it is a hot day, it probably will feel good to fall into the water. If you would really like to learn how to water ski, it is not impossible for water enthusiasts to learn how to master this fun sport in less than an hour, maybe even less time than that! Lake Mohave, Lake Mead, and Lake Patagonia are also good spots to consider for some ideal water skiing in Arizona. You will also find that there are many areas on the Colorado River that are perfect for Arizona water skiing with their carved out wide shape. What's nice is that you will find that these locations exist throughout the entire state, making it pretty accessible without having to travel too terribly long to get to the lake of your choosing. For lake information for Bartlett Reservoir, Canyon Lake, Saguaro Lake, Apache Lake and Roosevelt Lake, check out the United States Department of Agriculture Forest Service. If you would like to view a list of lakes in Arizona where you can cool off, you can access the Arizona Lakes Directory.